The investment management firm's decision is a positive development for YHOO, which had seen its shares tumble for most of the week on concerns that as it sheds its portfolio of overseas investments, the remaining core business will be valueless. 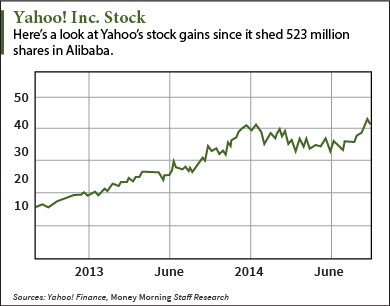 YHOO stock has seen a nice two-year run. With YHOO's more than 20% stake in Alibaba Group Holding Ltd. (NYSE: BABA), investors saw the U.S. company as a cheaper way to buy into China's booming e-commerce sector at a discount ahead of the much-anticipated Alibaba IPO. YHOO stock was just above $40 pre-BABA IPO, while BABA was trading at $68 before closing at $93.89 on its first day of trading. YHOO stock gained 170% from the time of its initial sale of part of its once-40% stake in BABA in 2012, delivering an impressive $3.31 earnings per share (EPS) to shareholders. But YHOO can't ride the Alibaba hype forever. At some point, the struggling U.S. tech company will have to stand on its own. It's first challenge post-Alibaba IPO? Finding a tax-efficient way to sell its remaining stake in BABA – one that delivers on the true value of its almost decade-old investment and gives shareholders bang for their buck. With Starboard taking a position in the company, one of its initiatives is to unlock "the substantial value from Yahoo's non-core minority equity stakes in Alibaba Group Holding Limited ("Alibaba") and Yahoo Japan in a structure that delivers value directly to Yahoo shareholders in a tax-efficient manner," according to a letter from Starboard managing member Jeffrey Smith sent to YHOO Chief Executive Officer Marissa Mayer. YHOO held a 24% stake in BABA before the IPO, but sold about 140 million shares to reduce the stake to 16.3% on Sept. 19, all a part of a "proposed staged exit" of YHOO investment in BABA the two companies negotiated back in 2012 and amended twice. There are close to 400 million BABA shares remaining, valued at about $36 billion according to Barron's. YHOO Chief Financial Officer Ken Goldman said that sale will be "fully taxed" in an earnings call in July. "Regarding tax-efficient structures on the remaining equity holdings, we approach all transactions with the goal of maximizing long-term value for our shareholders," Goldman said. "These transactions are complicated, can take multiple years, involve multiple jurisdictions, and generally are not disclosed before completion."